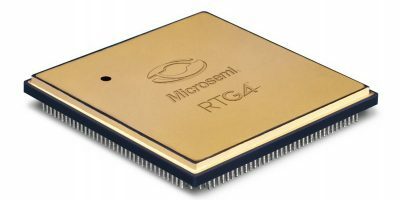 Space customers can now use Microsemi’s RTG4 FPGAs for prototyping and fast design times, says the company. The RTG4 high-speed signal processing radiation-tolerant field programmable gate arrays (FPGAs) have achieved Qualified Manufacturers List (QML) Class V qualification. Awarded by the Defense Logistics Agency (DLA), the designation is the highest level of qualification for space components and a necessary step to satisfy mission assurance requirements on many space programmes. It is believed to be the first and only radiation-tolerant FPGA offering more than 150,000 logic elements to achieve a QML Class V qualification. It can bring the cost and schedule advantages of FPGAs to the most demanding space missions, says Microsemi, which until now have been unable to use a high-speed radiation-tolerant FPGA in their signal processing systems. RTG4 FPGAs can provide more signal processing bandwidth than has been previously available in radiation-tolerant non-volatile FPGAs and enable designers of satellite on-board data processing systems to take advantage of the easy prototyping and fast design cycle times FPGAs provide, adds Microsemi. The QML Class V qualification is increasingly important as a growing number of satellites are being built to perform a wide variety of missions, including imaging, communications, navigation, science and monitoring of weather, climate and natural resources. Many of these systems require the highest level of component quality, particularly when large revenue streams depend upon the satellites functioning correctly, or when there are national security considerations. In addition to satellites, the RTG4 FPGAs are suitable for applications including space launch vehicles, planetary orbiters and landers, and deep space probes. The RTG4 FPGAs have achieved QML Class Q and MIL-STD-883 Class B qualifications. The company is already a QML-V certified manufacturer of high reliability FPGAs for space applications. Microsemi is a wholly owned subsidiary of Microchip Technology and serves the aerospace and defence, communications, data centre and industrial markets. Products include high-performance and radiation-hardened analogue mixed-signal integrated circuits, FPGAs, SoCs and ASICs, power management products, timing and synchronisation devices and precise time solutions, voice processing devices, RF solutions, discrete components, enterprise storage and communication solutions, security technologies and scalable anti-tamper products, Ethernet solutions, Power-over-Ethernet ICs and midspans; as well as custom design capabilities and services.